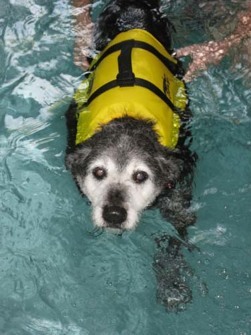 This is my friend Marianne’s dog Schlomo in hydrotherapy. The poor thing is struggling to walk and so Marianne has him in hydrotherapy. Go little Schlomo go! Oh God, look at that face. Who can not love animals? I’m having a crisis of confidence today, and I’m thinking the best thing to do might be to stop working. I’ve been writing, editing, day in and day out. And I think I’ve come up with good solutions to some problems that were brought to my attention. Even today when I thought I was done I got a cool idea which I just implemented. But now I look at it and I can’t tell what I have anymore. Step away from the book, Stacy. My band has a great gig tomorrow night, just a couple of blocks away from where I live, in a park. Playing outside is my favorite thing in the world. And here’s a gig I just have to step out the door to play, but I don’t know if I can. My doctor said to practice and see what effect that had. He said I might cause more damage, and I might not. So, I’m going to do the heat/exercise/stretch/ice thing and see. I might as well do that now … instead of mess up my book. Step away from the book, Stacy!